Then in 1st method, can await on the variable! Use Threadpool, task parallel library, parallel for? But is it really taking 100 ms per house? Is it CPU-bound or I/O-bound? Threadpool – may get another bottleneck? Wow, this is great. Learning async tricks from Mads..
Synchronous wrappers for asynchronous work – NO ! How many allocations are required for async state machine? One of the most important things that differentiates a “quick and dirty” application from one that has been designed well is how the application’s user interface behaves during lengthy operations. The quick-and-dirty approach is to just do all of your work in a button’s Click event handler and not worry about the user interface. The problem with this is that the GUI will freeze up while the application does whatever work it needs to do. A well designed application, on the other hand, is one that is careful to do as much work as possible in background threads, keeping the GUI responsive and making sure that it makes it obvious to the user that work is going on in the background and adjusts the GUI to disallow any user actions that don’t apply until after the work finishes. Under .NET 2.0, doing work on a background thread has become a lot easier, with the introduction of the BackgroundWorker class. You no longer have to worry about cross-threading exceptions and checking a control’s InvokeRequired property. In this post, I’ll create a simple example of how you might use the BackgroundWorker class to do some work on a background thread and keep your GUI responsive. We’ll start with a simple example that demonstrates how the GUI can become blocked and then evolve the application to make full use of the capabilities of the BackgroundWorker class. Here are the basic players. We’ll have a FileReader class/object that reads text from a text file. And a Win Forms form with a button to initiate the file read operation and some GUI elements to display the status/results of the read operation. Let’s say that we just want to read a text file and return/display the number of lines found in the file. 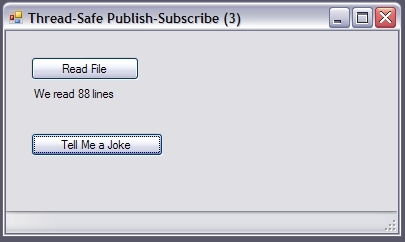 We can just make a call to our FileReader object, which returns the number of lines, and then display that number in our UI. Super simple. This iteration is implemented in the files Form1.cs and FileReader1.cs. Here’s what the GUI looks like. If you click on the Read File button, you get a File Open dialog where you can select a file to read. The file is read in and then we write out the # lines read, below the button. So far, so good. This is how most simple user interfaces are written–you click on a button, which launches a Click callback, which does some work, and then returns to the caller. And here’s the click event handler for the form: the guy that invokes ReadTheFile. But what if the function that does the work takes a longer amount of time? It’s pretty common for some action initiated by the user to take a little time. What happens to the GUI while they are waiting? We can simulate this by just adding a Thread.Sleep call in the ReadTheFile method. What happened? Well, because everything is on one thread, our user interface thread doesn’t respond to mouse clicks until ReadTheFile finishes. Worse, even though we set the label’s Text property before we call ReadTheFile, the message loop doesn’t get a chance to process that change, and update the text, before we go out to lunch in ReadTheFile. The easiest way to do some work on a background thread, keeping the GUI responsive, is to use the BackgroundWorker class. Do all work on a background thread. We want to move code into a separate library or class, rather than having it in our Click event handler, to keep our user interface code separate from our functional code. This is just a cleaner architecture and makes our code more maintainable, easier to test, and more extensible. We also want to do as much work as possible on a different thread from the main thread handling the GUI. If you do your work on the same thread, you risk locking up the user interface. (As we saw in Iteration #1). If you’re using the .NET Framework version 2.0 or later, the best way to do work on a background thread is to use the BackgroundWorker class. This class gives us the ability to do some work on a background thread, provides progress and completed events “out of the box” and also ensures that these callbacks execute on the correct (GUI thread). What do I mean by “execute on the correct thread”? Here’s how it works. To ensure that the GUI stays responsive, we want to do any non-trivial work on a background thread. This thread can run in parallel to the GUI thread, so the user will still be able to interact with the GUI while the work is being done. When the work finishes, we likely want to update something in the GUI to indicate this. (E.g. change the text on a label to indicate that the operation is done). Our GUI object will be notified by handling an event that the worker object fires. But since we need to update the GUI, this event handler must be executing on the same thread as the user interface. This last point is very important. The core rule in Windows UI programming to remember is: the only thread that can update/change a user interface control is the thread that created it. (This is true for Windows Forms applications, which use the Single Threaded Apartment model). Let’s change our earlier file-reading example to use the BackgroundWorker. This example can be found in the threadsafepubsub.codeplex.com project in the Form2/FileWorker2 classes. Here’s the new Click event handler, where we create the background worker, attach our event handlers, and then tell it to go do some work. // process as a parameter. We first create an instance of the BackgroundWorker class and then wire up the DoWork and RunWorkerCompleted methods. DoWork is the event that will fire when we call the RunWorkerAsync method. And it will run asynchronously, in a background thread, freeing up the user interface. Because RunWorkerAsync is launched in a background thread, control returns from the btnSelect_Click method quickly, and the UI is responsive, even while the file-read work is going on. We also hook a handler to the RunWorkerCompleted event, which will fire when our bgWorker_DoWork method has finished doing the work. This event, however, will execute on the original GUI thread–allowing is to update GUI elements directly within our gbWorker_RunWorkerCompleted handler. Here’s the body of our DoWork handler. // here in DoWorkEventArgs object. Notice that we just use our earlier FileReader class to do the actual work of reading the file. But there are two additions. First, because this method is invoked from the BackgroundWorker object, we need to somehow get the name of the file to process. We knew this filename back in the btnSelect_Click method and we hand it off by passing it as a parameter to RunWorkerAsync and then reading it out of the DoWorkEventArgs parameter. Similarly, when we finish doing our work (reading the file), we need to make sure the result (# lines read) gets passed back to our RunWorkerCompleted handler. We do this by setting the Result properly of the DoWorkEventArgs parameter. Here we see the other side of the e.Result handoff–we read the FileReader.ReadTheFile return value out of the RunWorkerCompletedEventArgs parameter. We also check this parameter to see if an error occurred. 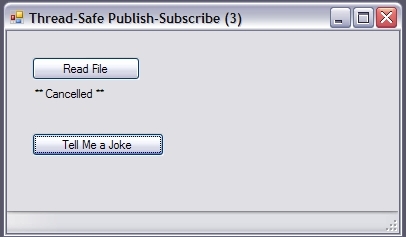 You can demonstrate the second part of this by clicking on the “Tell Me a Joke” button. 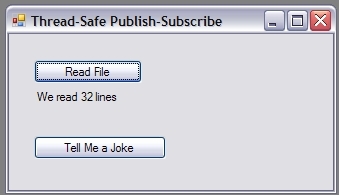 You’ll get a message box with a clever joke and you can then dismiss the dialog–all while the file read operation is still going on. Application state — what can/can’t the user do while the work is in progress? Let’s start with the busy indicator. It’s important to make it obvious to your users that something is happening in the background, and what that something is. You now have two file read operations running in parallel. Is this really what we want? Do we want to prohibit it? If not, how do we handle the results of two different file read operations, when the operations complete? How do we avoid mixing up the results? How do we know which operation the results are coming from? Is there a chance that the two operations will attempt to work on/with the same data? For our purposes, let’s agree that we really only want to allow the user to do one operation at a time. While one operation is in progress, a user cannot initiate another one. We’ll modify the GUI to enforce this. More than just indicating that some work is going on in the background, it would be nice to indicate how much work we’ve already done and how much work is left to do. This lets a user judge how long the entire process will take. Whenever you support doing some work on a background thread, you also need to consider whether a user might want to cancel this background activity. Unless it’s something that happens quite quickly, it’s probably a good idea to allow a user to cancel the operation and return to the original state (no file is being read and they are able to select a new file to be read). Notice that we enter the “reading file” state when the user clicks the “Read File” button. 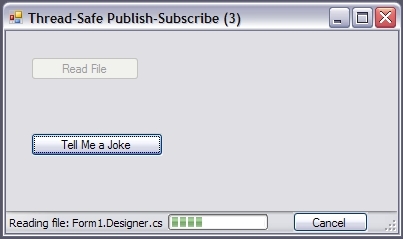 But while in this state, the user cannot press that button again–they either press the “Cancel” button, or we return to the original state when the file read operation completes. Also note that we should be able to display a joke while in either state. This confirms what we said earlier–the GUI won’t lock up during the file read operation. Note that we now tell the user what file we’re reading and we display a progress indicator, showing how far into the read operation we are. We also give them a Cancel button, allowing them to Cancel the operation before it completes normally. Also notice that the Read File button is greyed out—the user can’t initiate another operation until the first one completes. Notice that when we finish reading the file, returning to the Idle state, we hide all of the progress/cancel widgets. The Read File button is also enabled again. Again, all of the progress/cancel widgets are gone, since we’re back in the Idle state. And the Read File button is available again. But this time, we tell the user that they cancelled the operation. The code for this iteration can be found in threadsafepubsub.codeplex.com, as Form3.cs and FileReader3.cs. We added a couple of things at the top of the class–an enumeration to keep track of our state, and a class-level BackgroundWorker instance. (We move this variable into class scope because our Cancel button will need access to the BackgroundWorker object. Here’s the actual code for the new SetAppState function, as well as a helper function that sets visibility for several controls. // Set new application state, handling button sensitivity, labels, etc. We’re basically just changing the visibility of the various progress widgets in the StatusStrip at the bottom of the form. We also handle enabling/disabling the File Read button here. The Click event handler for our File Read button is also slightly different. 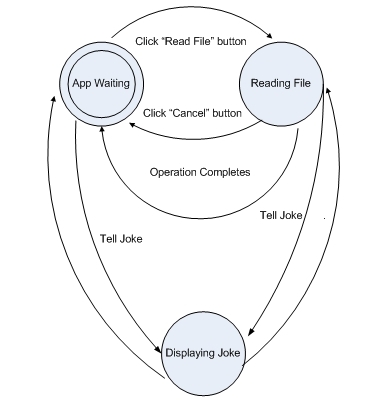 We add a line that sets the application state to indicate that a file is being read, we attach a handler to track progress, and we add an exception handler to ensure that the application state is set back to idle if anything goes wrong. Note also that we have to explicitly tell the BackgroundWorker that it should support both progress and cancellation functionality. This one is pretty simple—we just set the value of the progress bar, which runs from 0 to 100, to the reported % complete value. // parameter that gets passed into the RunWorkerCompleted event handler. // So we can handle the exception in that method. // Cancel flag, because RunWorkerCompleted event will still fire. I added a note to remind us that exceptions originating in this chunk of code (or on this thread) are automatically made available to us in the RunWorkerCompleted handler. Notice also that we’re now passing the BackgroundWorker object into the ReadTheFile method. We do this because we need access to it, within this message, to check for user cancellation and to report progress. Finally, we see a piece of the cancellation infrastructure here. Below is another code chunk to help us understand how the cancel operation works—the click handler for the Cancel button. This is a little involved, but if you walk through the code, you’ll see how things work. There are just a couple of new things here. We now check the Cancelled property and display a message if the operation was cancelled. We also add a finally block, where we ensure that we transition back to the Idle state, whether things completed normally, the user cancelled, or there was an error. // out and fall back to the _DoWork method that called us. We’ve basically added two things here: support for cancellation and for progress reporting. To support user-initiated cancellation, we just check to see if the operation has been cancelled, after each line in the file that we read. The frequency with which you check for cancellation is important. If you don’t check often enough, the application will appear to not be responding to the cancel request and the user may become frustrated. We report progress (% complete) by invoking the ReportProgress method on the background worker. We do this after calculating the actual progress, in terms of # bytes read so far. In the world of software demos, doing something with Twitter has replaced Hello World as the most common target of a demo. At the risk of polluting the world with yet another chunk of code that does something with Twitter–I’d like to play around a bit with Silverlight charting and Twitter seems a great context for demoing what is possible. But before I can start creating a Silverlight demo, I need a basic Twitter API wrapper in .NET. So here’s a starting point–a simple example that uses LINQ to get a list of people that you follow. This is a good starting point for later demos. Twitter provides a simple REST API that lets you do basically everything you’d want to do using simple HTTP GET, POST and DELETE requests. You can learn everything you need to know about the Twitter API at the Twitter API Wiki. I’ll assume that you generally know how Twitter works–you follow some folks, some folks follow you, and you all post status messages–which your followers can read. That’s the beauty of Twitter–pretty simple. But here are some things that you should know about the Twitter API. Some API method calls require authentication, using HTTP Basic Authentication. Any app invoking calls that require authentication will need to supply the proper credentials. You can receive a special dispensation from the Twitter gurus to be allowed up to 20,000 requests/hr. What happens when you hit your rate limit? Well, basically your application (your IP address, actually) can no longer make requests of Twitter–until the rate limit resets. You can see how these work by just entering the above URLs into your browser and looking at the XML data stream that comes back. Let’s start building a simple Twitter API wrapper in .NET with a very simple class to encapsulate information about a single user–either yourself, a follower, or someone that you follow. This doesn’t cover absolutely everything that we can find out about a Twitter user, but encapsulates some of the basic stuff that we care about. (For these examples, I’m using Visual Studio 2008 — C# 3.0). Super simple class, made much easier through the user of C#’s automatic properties. As an example, using me as a Twitter user, my ScreenName would be “spsexton” and my Name would be “Sean Sexton”. Now that we have an object that wraps a “peep”, let’s create a special class that represents a collection of Peep instances–or “peeps”. For example, an instances of Peeps could be used to store a list of everyone that we follow (or everyone that follows us). We’ll use our old friend, the List(T) class, from System.Collections.Generic, which implements a strongly typed collection. Basically, a collection of Peep objects will look like this: List<Peep>. But we’ll create a subclass so that we can add a static method for building up a list of everyone that we follow. Here’s the full code for Peeps.cs, followed by an explanation of how we do things. // headers in the response. (Then later constitute the XDocument). Notice that all we have in the Peeps class at this point is a static method, PeopleFollowedBy, that returns a collection of Peep objects, one for each person that the specified screen name follows. The first thing that you’ll notice about the code is a loop where we get consecutive pages from the Twitter \statuses\friends\screenname.xml page. By default, you get only 100 users at a time when invoking this URL. So the easiest way to get all people that someone follows (their “friends”), is to request consecutive pages until you get one back that contains no users. At each step through the loop, we construct a List<Peep> object from the XML results and then add that collection to a master collection (which this function will return). This is actually the simplest way to get the results of the Twitter API calll into an XDocument, and ready for querying. Using this single line, you could replace the next five lines of code that end with another XDocument.Load. What’s going on here is the core of what we want to do–load up an XDocument from the URI that represents the Twitter API call. But in my code, I go to a little more effort to create an HttpWebRequest and then get the HttpWebResponse for that request. I do this solely for the purpose of getting Twitter rate limit information out of the header of the response. If you’ll recall, Twitter has a 100 calls per hour rate limit by default. The nice thing is that the API tells us the rate limit, as well as the # calls remaining, after each request. So we read that from the header and keep track of it. For now, this rate limit information is just returned to the caller. But my intent is to use it in a future example to actually slow down my Twitter calls, as needed. This will be helpful when we want to batch up a large # of Twitter calls, but we don’t want to risk maxing out our rate limit. More on this later. I get the rate limit info from the header in the TwitterUtility.GetInfoFromResponse method, described below. Now for the LINQ part. Once we load up the XDocument from Twitter’s response, we can build up a collection of XElement objects corresponding to the list of users in the XML stream. But this isn’t quite what we want.. To get the data from the XElement objects into our List<Peep> collection, we need to do a simple LINQ query. (Thanks to a post by Wally McClure on the basic idea for the LINQ query: Calling the Twitter API in C#). The LINQ query is pretty simple–we grab each user element from the XML stream and create a Peep object for that user. We initialize all the fields of the new Peep object for which we can get data from this XML stream. (We can’t get NumFollowing or NumUpdates–we’ll have to make a different API call to get that information). In most cases, we’re asking for the value of an XML element that is a child of the <user> element. E.g. the <id> element. And we call helper methods in some cases, since the elements that we’re trying to read might by null. (Actually, I haven’t tested this thoroughly–some of the other elements might occasionally be null and so it wouldn’t be a bad idea to use a “safe” accessor method on all of the elements). Finally, we need to convert the result of our query–which is IEnumerable<Peep>–to a List<Peep> by calling the ToList() method. Then we add this new list to the master list that we are building. One final thing remains for this function–handling the case when we exceed our rate limit. I added a simple handler, to make it a little more obvious to the client that we’ve exceeded our rate limit, rather than letting the underlying WebException bubble up. This is a little bit sloppy, since there are other things that might throw a WebException. But this is a good start at giving the caller a little info on the rate limit issue. Here is the full code for the TwitterUtility class, which just contains a handful of helper methods that we make use of in the Peeps and Peep (see below) classes. /// Pull a couple fields out of the header--specifically, the Twitter API rate limit info. /// of the status element not being present. (Note: Both the <created_at> and <text> elements are under the <status> element). This method returns a bunch of info about a particular user, including # following and # updates. (See the XML output at the top of the post). So the obvious thing to do would be to add an assignment in our LINQ query, calling a helper method to go off and call this other Twitter API method, right? For each user, we could call show.xml and get the remaining two fields. The problem with including this 2nd Twitter call in the LINQ is that we’ll blow out our Twitter rate limit. We only get 100 requests per hour, so we’d run out of steam trying to flesh out the first 100 users. (And any Twitter user worth his salt follows at least 100 people). So what is to be done? For now, I add code to the Peep class (see below) to get the remaining info on a “peep by peep” basis, rather than getting everything all at once. This is a bit of a cop out, since we leave it up to the client to decide how often to call this method. I’ll do a 2nd post where I actually add code to make these additional calls, but in a “rate limit safe” manner. (Hint–we’ll use timers to slow down our use of the Twitter API). So until we get some “rate limit smart” code, here’s the expanded code for Peep.cs, including a method that calls show.xml to get the additional info. /// multiple users, but must be retrieve for each user individually. The CalcAddlInfo method just invokes the show.xml API call and then reads the friends_count and statuses_count fields. The code for this couldn’t be simpler. I just call the Peeps.PeopleFollowedBy method, which returns an instance of the Peeps class (which is really a List<Peep>). And then I bind the collection to a DataGridView. Presto. (If you’re paying attention, you’ll also notice that my rate limit is listed as 20,000/hr, rather than the default 100/hr. This is because I requested “white list” status and the Twitter crew kindly consented to bump my rate limit. This applies whenever I’m making API calls from my specific IP address). For what it’s worth, here’s the event handler code for the Load Grid button in the GUI. Notice that I also make a test call to the CalcAddlInfo method–so we can step through the call in the debugger and see how it works. That’s all there is to it–the process of making calls to the Twitter API from .NET code and consuming the resulting XML data using LINQ is pretty straightforward. Making my API methods smart about rate limits, using timers to acquire Twitter data quietly in the background–at a rate that is just slow enough to not trigger the rate limit.